Here at SKVW, I like to review a wide variety of e-Cigarettes. I’ve used everything from basic starter e-cigarette kits to more specialized personal vaporizers. Today, I’m going to add another category to the mix: the high-end model. 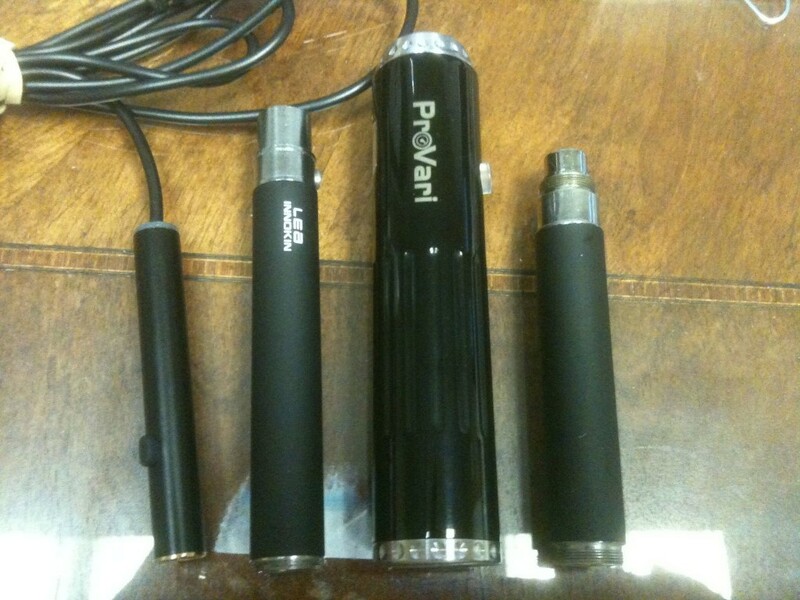 Let’s take a look at the ProVari e-cigarette in this review. Update: ProVape recently announced the ProVari V2. The update is incremental so most of the features are unchanged. The new model has a higher amperage rating to better handle dual coil cartomizers. The ProVari will stand out in a crowd due both to its fairly large presence and attractive styling. 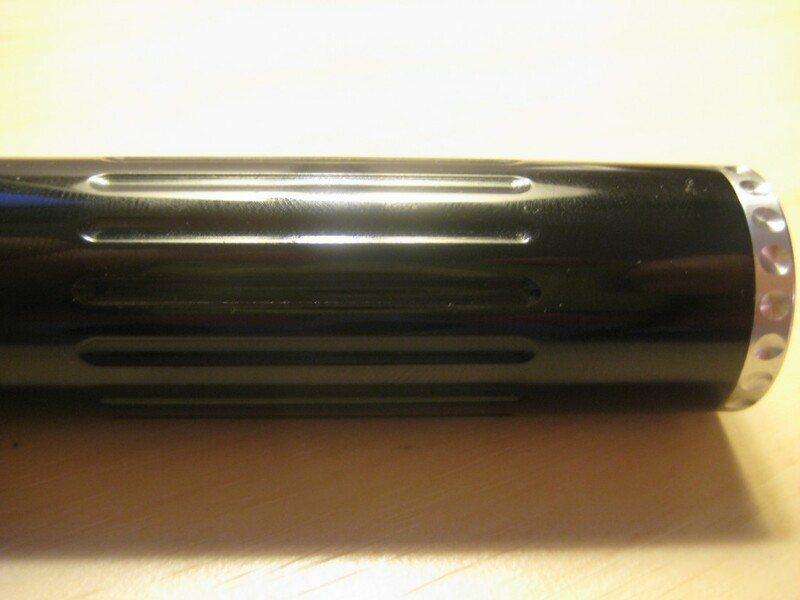 On the surface, it is a large-ish metal tube with stylized end caps and fluting on the bottom half of the tube reminiscent of a sports car. When picked up, there is a significant heft to the unit that lets you know this is nothing like the typical stick or eGo style e-cigarette. With the optional extended end cap, the ProVari positively dwarfs more standard devices like the eGo. The end cap allows you to run a higher capacity 18650 battery instead of the standard 18490’s to give you about 50% more capacity. This should get most vapers through a full day easily. I get well over half a day on the 18650’s as it is. While I opted for the black chrome finish (which appears to be one of the most popular) the ProVari is available in several other colors. Options include original (brushed), chrome, black chrome. A 24k gold plated model was just announced so you can look like Jay-Z out on the town while you’re vaping. At the heart of the ProVari is a small computer chip that controls the voltage regulator which powers the whole show. 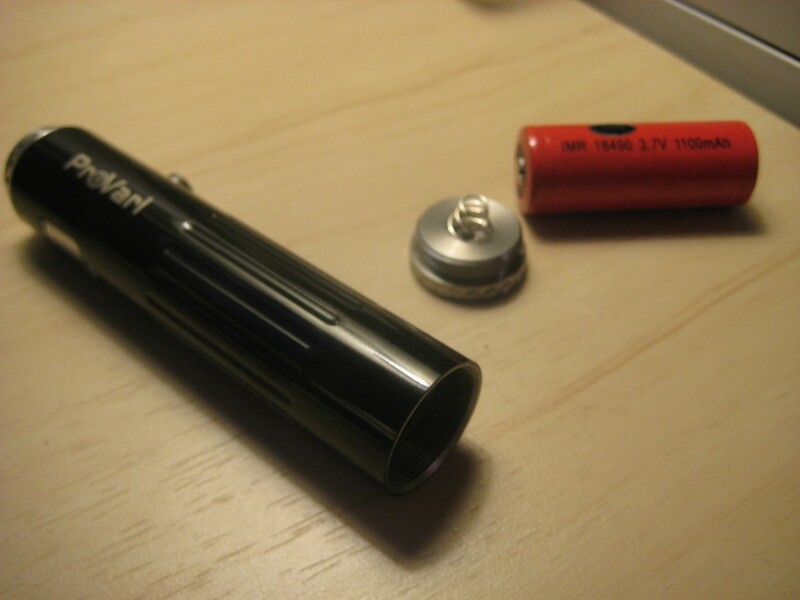 You may have noticed the ProVari uses a single battery. Specifically, it uses a single 3.7 volt battery. 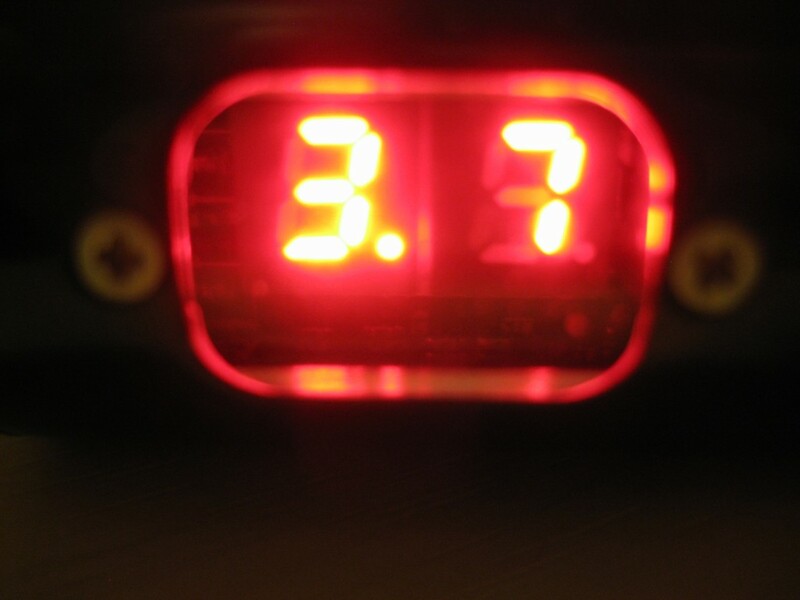 Voltages above 3.6 are achieved through a step-up voltage regulator managed by the microcontroller. The tiny computer inside the ProVari beyond controlling voltage is also in charge of keeping your investment safe. The system has a number of safeguards that will shut down in the event an unsafe condition is detected. These conditions include a short circuit in the atomizer, overheating or too much amperage being drawn by your setup. This handy feature can also be one of the shortcomings of this unit. The ProVari isn’t quite multiple-coil aware, so it reads the resistance on dual coil caromizers and shuts off if you try to run them at anything higher than around 4 volts. There is a lot of math behind that, and it confuses me, so I’ll just leave it at you can’t run dual coils above 4v. This is of course an issue as a lot of people like to run their multi-coils at 5v or even higher. Using the ProVari is pretty straight forward, push the button and vape. However, changing the settings or running the diagnostics are a bit more involved. The unit features a single button, so all control must happen with the single button. I'm not about to take this apart to get a pic of the CPU! The control system works by pressing the button multiple times to navigate through a menu then pausing for the item to come up and then more clicking to select your desired setting. To get into the menu system, press the fire button 5 times, this will drop you into the PU (power up) menu. If you pause for 3 seconds you can adjust the menu. Click 2 more times to get to the next option and so on. Describing the menu system is actually more complicated than using it. Once you understand how it works, it’s fairly intuitive. There are still some annoyances with the system. For example, checking the resistance takes you 13 clicks to get to the menu item. Did you accidentally press the button too many times? Let go so it will reset and start over. In addition, there’s no quick way to power off the unit. You have to go through the same menu system, select the PO menu, wait 3 seconds and then click to turn it off. Repeat the process to turn it back on. Some method of being able to turn it off or on via some other faster method would have been preferable. Of course I have no idea what that would have been, so maybe the current system is the best way. Fortunately, unless you like to swap cartos like an e-cigarette reviewer, you probably won’t need to spend that much time in the menu. The ProVari does an outstanding job of keeping the output consistant. Once you find the right settings for your preferences, you just leave it. Settings will remain persistant between battery changes. In all honesty, I don’t have a lot of things I can fault the ProVari on. Anything else is really pure wish list stuff. While I’m on the wish list, one feature that is lacking is a wattage calculator. I’m pretty sure something like the ProVari is smart enough, so if it had a display to show you what your wattage was with your atomizer and voltage combination, that would be pretty handy. Other luxury models like the Darwin operate by setting the wattage rather than the voltage. From a performance standpoint, the ProVari will deliver what you want it to as long as you’ve got a single coil. Want to run it like an eGo, turn it down to 3.3v. Want a high voltage atomizer for a warm vape, crank it up to 6 and go to town. If ever an e-cigarette could be called a Cadillac model, it is the ProVari. Just like a Cadillac, this model is expensive, big, heavy, shiny and sleek. Features abound for selecting voltage, checking resistance and keeping your ride safe thanks to the built in microcontroller. There are a few faults with the ProVari, mostly little annoyances more than anything. The performance and styling make it easy to overlook any shortcomings. No wonder this thing is on many a vaper’s wish list (or in their arsenal already). I guess you had to have something as a 'Con' for credibility reasons… But you really had to look for those, didn't you? lol Not much to dislike about a ProVari, that's for sure! By the way, the only reason you're "Unable to run multiple coil cartos at higher voltages" is because they are generally low resistance, thus at higher voltages you would be drawing too much current to be safe. Toss a dual coil carto on and use the 'ohms check' feature and you'll see. The cons are definitely on the light side on the ProVari. I've seen some folks grouse about the low voltage issue with the dual coils on the forums, so figured it was worth a mention. But you are correct, anything that limits the amperage would be limited in how hard it could push something like the dual coils which run in the 1.2-1.5 range or so in general. Arg Steve! You have the black Provari! I'm so jealous. I got myself a chrome (as it was the only one left in stock) + end cap, coz I didn't want to wait it out for a few weeks. Great writeup anyways, well done. Don't be too jealous, I think there are more people with black ones than chrome. What I've yet to see is anybody rocking the gold plated version. I'll hold out for platinum with rubies in it I think. Hey Steve I have Two Provari’s the Satin and the Black and I will soon be rockin the Gold. The Provari’s is an awesome mod. I have been using my Satin one for over a year now. I can find no faults with them and Provape the manufacture are awesome. One really can’t go wrong with this mod it’s proven its self to me and I’m a heavy vapor. The ProVari tends to be the gold standard. Mine's a little beaten up from keeping it in my pocket, but it's going strong and it's one of the few things I can say I use every day. Oops. How come my recent post showed up below my comment? Pls feel free to delete that, wasn't my intention! It's not a bug, it's a feature! I use something called Comment Luv on my comment system. It basically goes out to your blog and links the most recent article. Sort of a way to reward people for commenting. If you don't want to do that in the future, just uncheck the comment luv box when you type your reply.